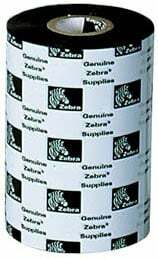 The Zebra 5100 Premium Resin is a premium resin ribbon for printing images in harsh environments. Provides unparalleled resistance and dense black images. Produces images resistant to the harshest environments. This ribbon is recommended for use with Z-Supreme products in printed circuit board applications. UL recognized and CSA component acceptable when used with Zebra approved labels. The Zebra 05100BK04045 is also known as ZEB-05100BK04045-C	.